Some posts on this site contain affiliate links. This means if you purchase something through one of these links, we may earn a small commission at no additional cost to you. The route is arranged in a 6.6 km loop through the city and you are welcome to start or stop at any point along the route but you must walk in the clockwise direction indicated on the map to ensure a smoother flow of traffic. The light show is in full swing between 7pm to 12am. Get a free map from the information points in Sint-Pietersplein, Emile Braunplein, Woodrow Wilsonplein and by Sint-Jorisbrug or download it online and print it off ahead of time or in GPX format to use in Google Maps on your phone here. The festival is held in winter at the end of January and the beginning of February. 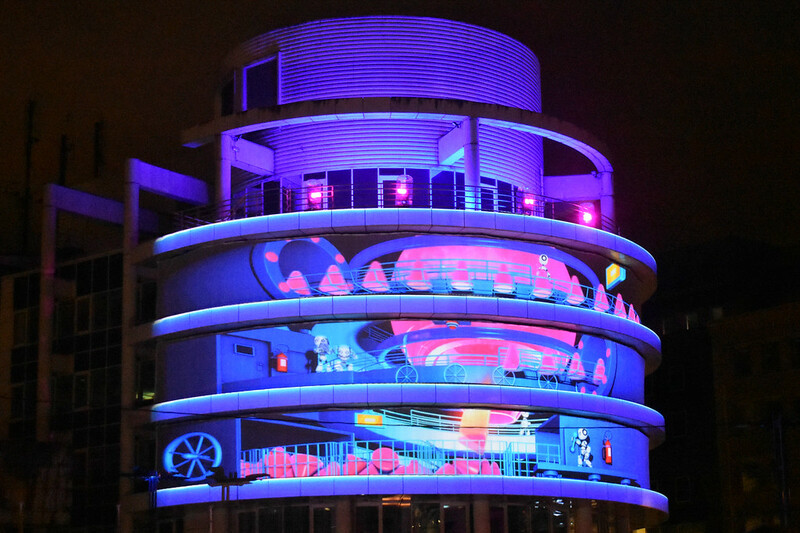 The Light Festival occurs once every three years, and the 2018 edition runs from January 31 until February 4 from 7pm to midnight with an earlier start on Sunday at 6pm. 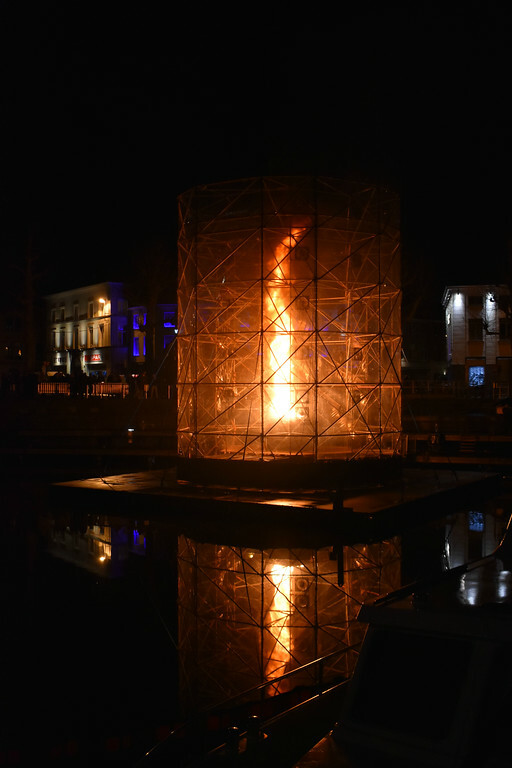 The following Ghent light festival will take place in 2021 in the last weekend of January. Congestion can be a problem in Flanders particularly around Antwerp and Brussels. Traffic accidents occur often and randomly, more so due to the volume of traffic on the roads rather then incompetency. We check Google Maps to see what traffic holds in stock for us before we leave the house so that we can either coordinate an alternate route or plan to leave earlier. During the Light Festival at night time the city centre streets are pedestrian zones only. This means the buses and trams are not running in the centre nor will visitors to Ghent access parking in the centre. The best parking spot in our opinion is under Sint-Pietersplein. We arrived around 7:30pm and there were only 126 spots left. Within 15 minutes it was completely full so the earlier you arrive in Ghent the less stress you will endure in the quest for a parking space. Click here to find Car Parks and Park & Ride (P&R) stations in and around Ghent here. P & R stations are free but you will have to take buses or trams to and from the station closer to the centre. Check the transit website of De Lijn for schedules and ticket prices. Alternatively, you can take the train and avoid parking altogether. The railway system in Belgium is extensive and relatively inexpensive depending on which transit offer you qualify for. Check the Belgian Rail website for timetables, connections, and prices. 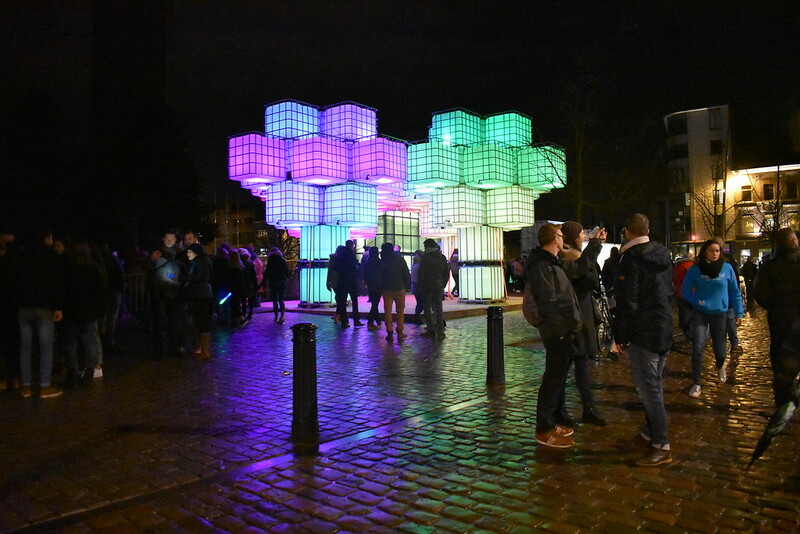 There are 37 light installations of varying sizes and shapes. Depending on when you arrive, how cold it is, and how long you are willing to walk, it might be nice to break it up into two evenings rather than one if you want to see them all. We have selected our favourite pieces to give you a glimpse of what to expect this year and in the following years! 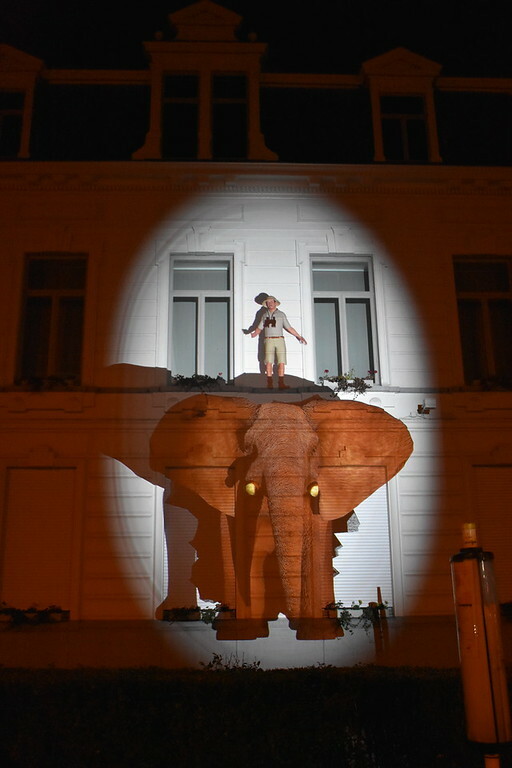 The Time Paradox by Limelight from Hungary, Budapest on the facades of Saint Pietersplein. 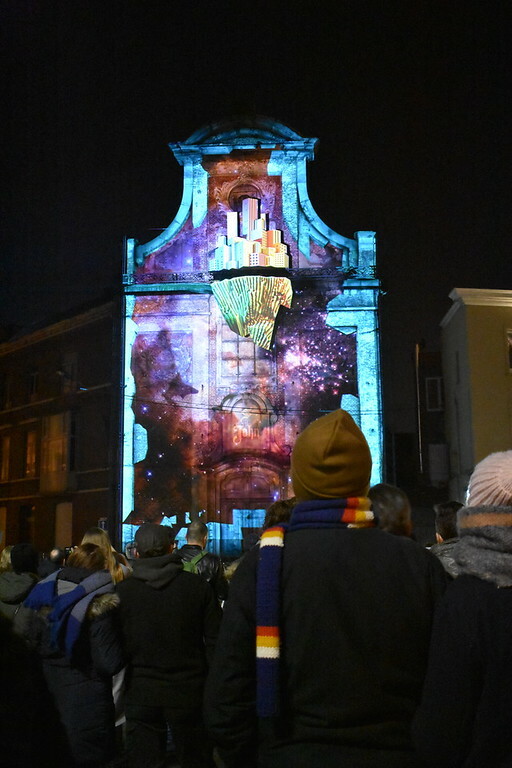 This is a dynamic 3D projection mapping light art piece of a time travel journey in the city of Ghent. Check out their website here. Binoculars to Binoculars From by Varvara & Mar from Estonia, Tallinn on the Muinkkaai. Check out more of their work on their website here. Bring your eyes to the binoculars and have your eyes transported to a big screen across the river to become the observer rather than the observed. 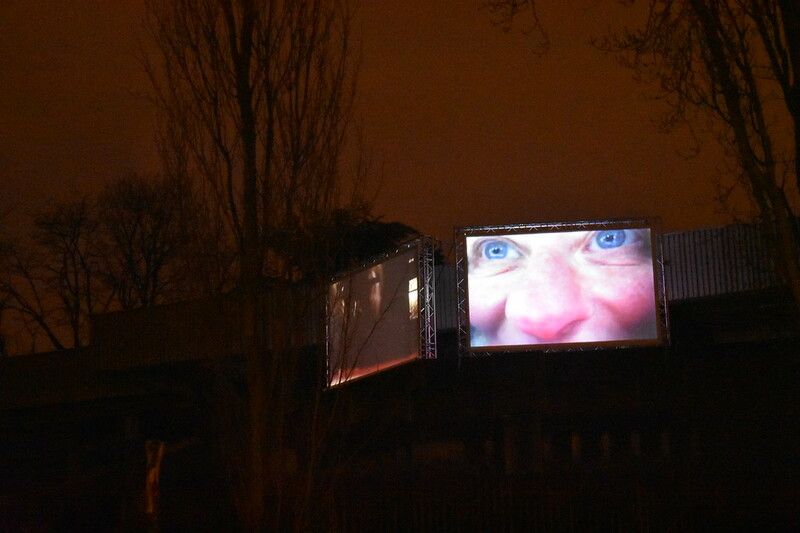 Time Colours by local Ghent resident Injas Devoldere, Tallinn on large screens over the river opposite the banks of the Muinkkaai. Just as the colors of daylight constantly change so do the colours of this installation. Check out more of his work on the website here. To The Rescue by Belgian artist Create on the Woodrow Wilsonplein. Watch as a cuberdon factory catches on fire and is put out by a real water. Check out more of their work on their website here. Tip:Make sure to buy some cuberdon candy otherwise known as Gentse neus or Ghent nose! Forgotten by Belgian artist Create on the François Laurentplein. Adding a twist to the legendary dragon that used to reside on the tower of belfry of Ghent, Create imagined the Dragon locked in a cellar for hundreds of years by citizens of Ghent who fear the dragon would spill the city’s secrets. 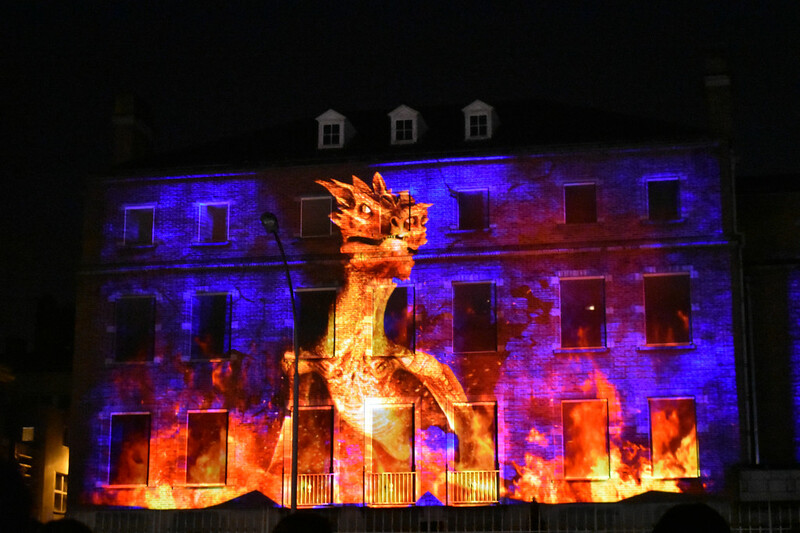 The light show follows the dragon’s emergence into the world ready to set the city who imprisoned him alight. Check out more of their work on their website here. Keys of Light by Dutch artist Mr Beam on the Bisdomplein. This interactive art installation requires visitors to play a piano. 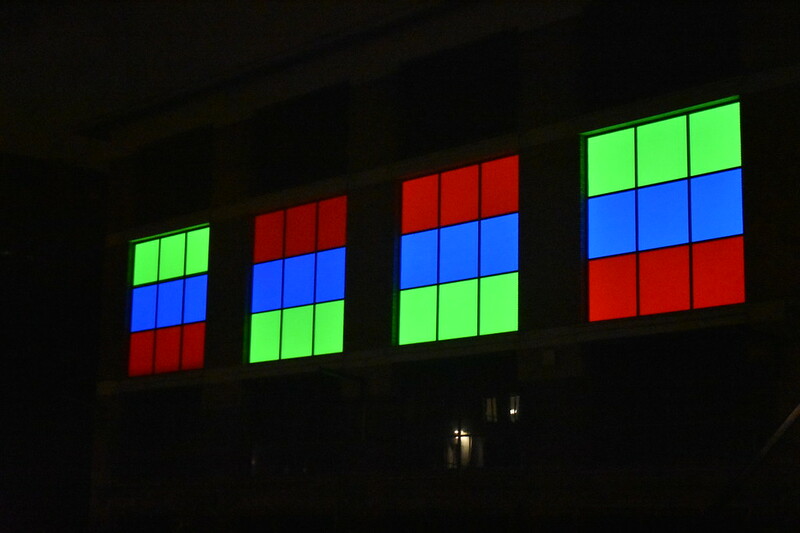 When the piano is utilized, light and animations are projected on the facades of the buildings around Bisdomplein. Check out more of their work on their website here. Pixel Forrest by local Ghent artist Bram Lemaire on the Oude Beestenmarkt. Upside down water containers have been arranged into brightly illuminated trees. The artist is lightly encouraging city dwellers to reconnect with nature. Check out more of their work on their instagram here. 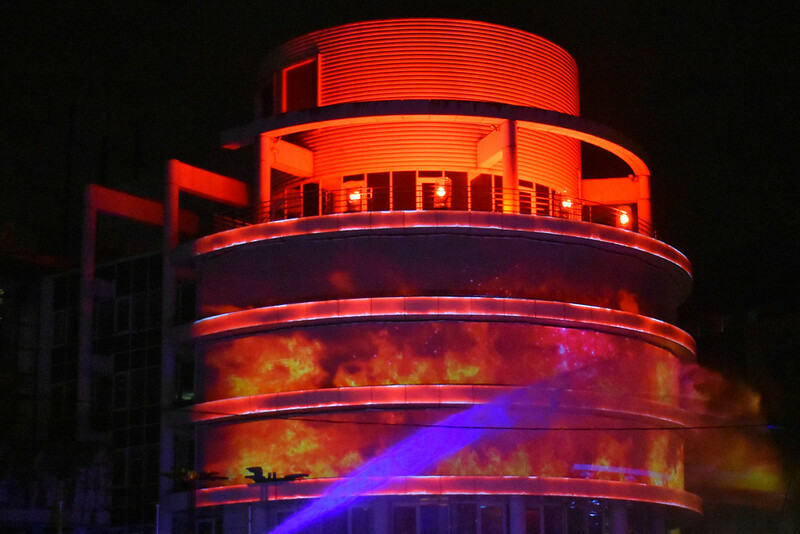 Large Fire Tornado by Dutch artist Ivo Schoofs on Porus Ganda. A 16m simulated fire tornado found in nature during forest fires and earthquakes, staring into the mesmerizing flames can turn your attention away from the cold of the night. This work is a nod to the strength of the nature world. Check out more of their work on their website here. Pattern 5.0, Live Sessies by Parian artist Milosh Luczynski on Zonder Naampark. 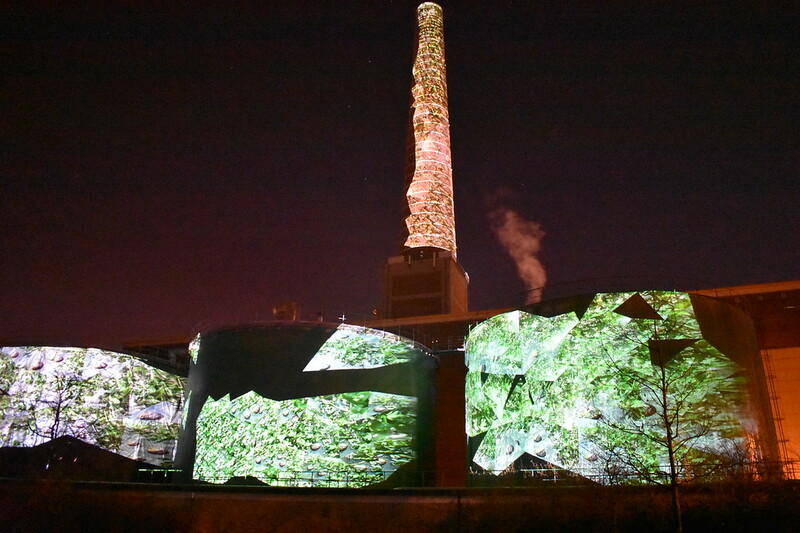 Turning the ordinary walls and silos of the Luminus power plant into a canvas of art each night of the Light Festival, Milo Luczynski improvises with images, auto clips and electronic music live. Check out more of their work on their website here. Ukiyo by local Ghent resident Nele Fack on Niewpoort. 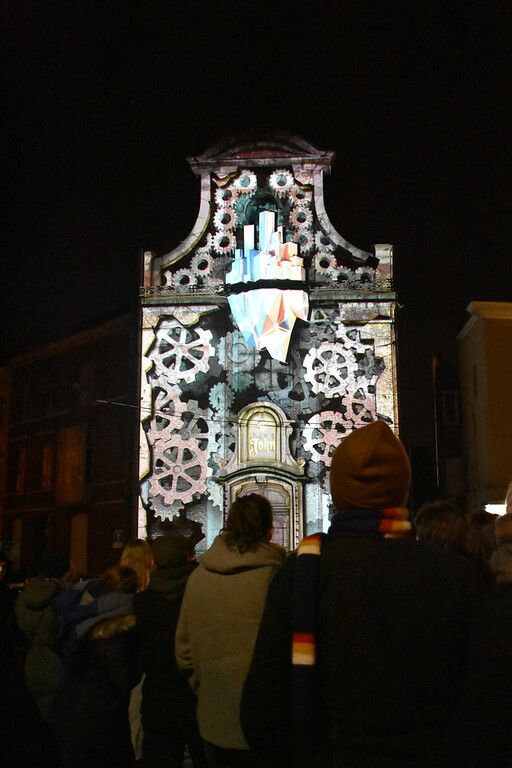 Watch as the fictional utopian city of Ukiyo comes alive in this light and music art show projected on the facade of a baroque chapel that has been turned into the art auction house of Galerie St-John. Check out more of their work on their website here. Urban Safari by Belgian artist Skullmapping on Vlasmarkt. Animals that gone extinct as a result of human activity come back to life briefly in this art installation. 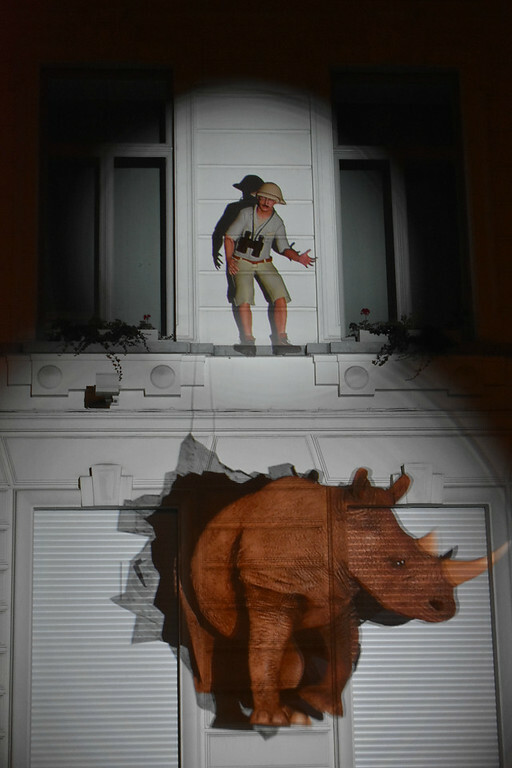 An animated safari ranger provides a commentary (in Dutch) educating onlookers on the cause of extinction for each animal that appears. Check out more of their work and watch the entirely of the show, with English subtitles on their website here. 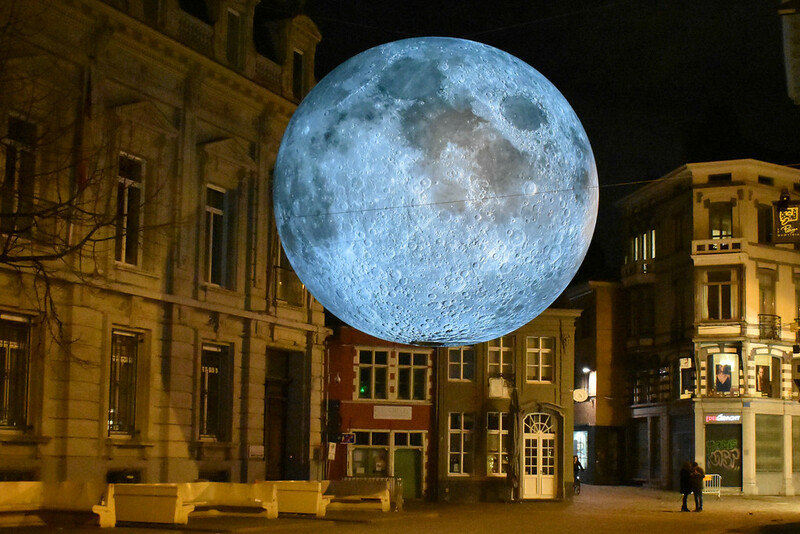 Museum Of The Moon by English artist Luke Jerram on Kalandeberg. There is a mysterious allure about the moon that has puzzled yet inspired people from all over the world. You may never get to set foot on the moon but the next best thing might be the 7m diameter reproduction of a moon hovering above your head in Kalandeberg. TIP: If you stop by after festival is finished for the night at 12am, you can hold the moon up with your arms with fewer people in the background. You are Here… Somewhere Else by French artist Matthieu Tercieux on Studentenplein. 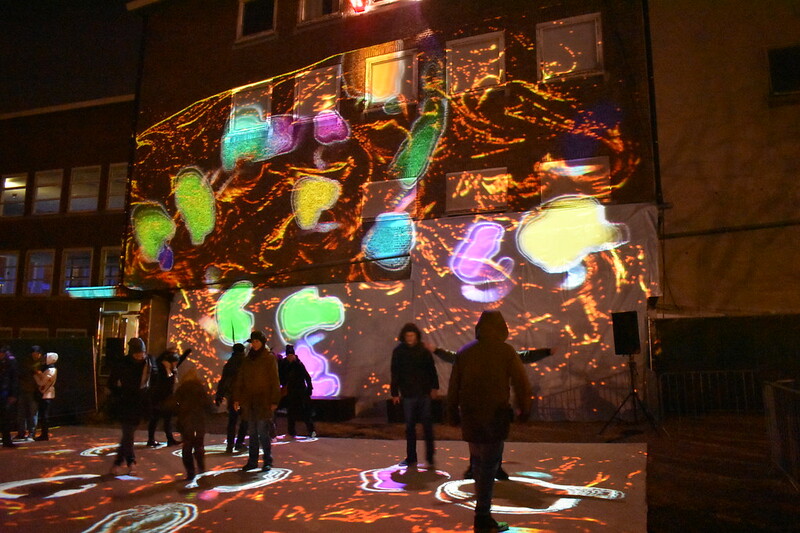 This interactive art installation gets you stepping, turning and twirling as different landscapes, colors and effects appear on the video projection screen cast on the ground below and the wall above. Check out more of their work on their website here. The lights may go out for the festival at midnight but that doesn’t mean your night has to end! Try over 200 types of Jenever at the brown bar ’t Dreupelkot or any of the hundreds of beers available at the popular Dulle Griet. More watering holes can be found at Sint Veerleplein, Korenmarkt, and Vrijdagmarkt. Hostel Uppelink -Situated next to Saint Michael’s Bridge in the center of Ghent guests have incredible views of historical buildings opposite the banks of the river below. Ganda Rooms & Suites – For a comfortable and quiet night in Ghent, this 18th century style townhouse in the center of Ghent offers clean and spacious rooms. Sandton Grand Hotel Reylof – An elegant 4 star hotel in the center of Ghent with high ceilings, bright airy living spaces, and immaculate rooms. We have had great experiences using AirBnB in Europe. If you’re are looking to stay more locally and are new to Airbnb you can sign up and get a $30EURO or $35USD discount off your first stay! 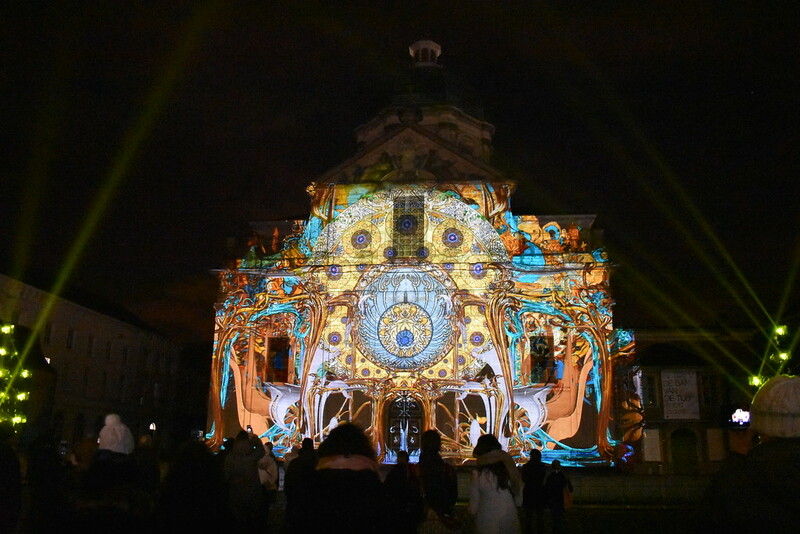 The Light Festival in Ghent is a lovely event to go to in winter with friends and family. It’s wonderful to see people walking outside, getting some exercise and enjoying the light pieces lighting up the city. 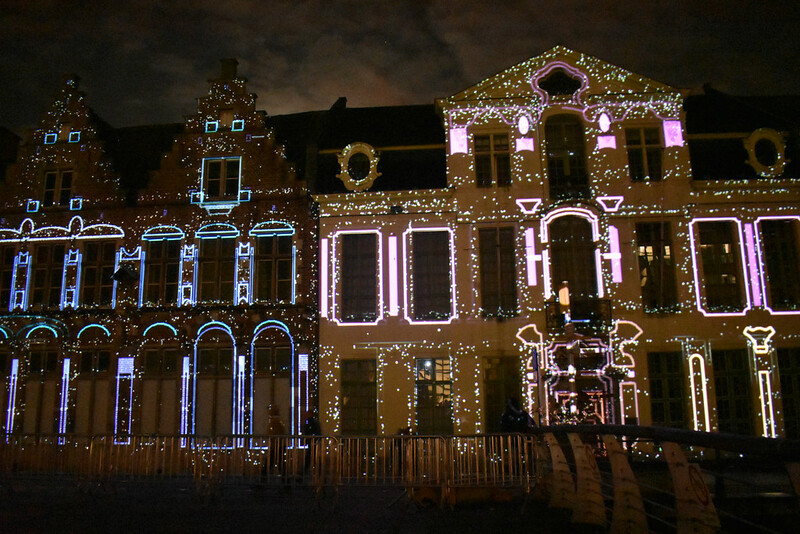 If you are travelling in winter or living in and around Belgium the Light Festival in Ghent makes a great excuse for a weekend trip away. The city of Ghent is one of my favorite places in Belgium and well worth a visit any time of the year. Did you enjoy this post? Share it with your friends or pin it for later!